Cruise to Birmingham's Gas street Basin & Cambrian Wharf with it's waterside pubs and colourful boating community, and experience Britain's second city, a thriving cosmopolitan centre, with some of the finest shopping, culture and visitor attractions in Europe & visit the Black Country 26 Acre Outdoor Museum & Dudley Castle & Zoo. Also visit Cadbury World at Bournville on the way back to the marina. Continuing on through the Tunnel, for those with children you might want to stop at the visitor moorings at Bournville (booking is advisable),which is 1 mile north of the Kings Norton Junction . It is sign posted from the canal. There is an exhibition dedicated to the history of chocolate, audio visual displays, Victorian Birmingham and a Jungle to explore! About 3 miles later you arrive at the Gas Street basin which is in the heart of Birmingham\\\'s canal network, and has been redeveloped into a unique experience where traditional narrow boats moor up next to cosmopolitan cafes and bars. The surrounding area is a vibrant arts & entertainment area and there are many shopping options within a short walk. There is so much to see in Birmingham that is is worth visiting the website. 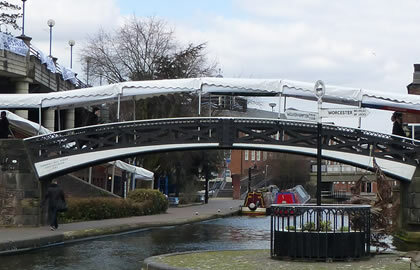 You can stay in the Gas street basin to explore the area's delights, or move on to visit the superb 26 acre outdoor Black Country Museum and the impressive ruins of Dudley castle & also visit Dudley Zoo (there are 3 locks en route), or catch a bus as they are well worth a visit. Cruising From the Gas Street Basin take the Birmingham Main line canal, & ignore the turnings left & right. 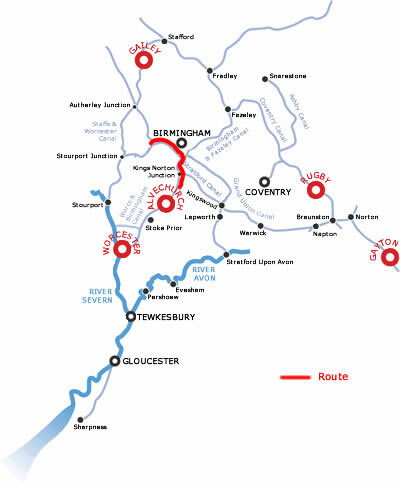 After about 3 hours cruising you will negotiate the 3 Factory locks, just after the last lock turn left down the Dudley Canal, and moor up near the 2nd turning on your left, near the Dudley Tunnel, for the Black Country Museum. Dudley Zoo & Castle are close by. The 26 acre outdoor Museum has been built around a re-constructed canal village, with a pub, shops and an inland port. You can ride on a trolley bus or tram, try sweet making , metal working or glass cutting, experience an underground coal mine & meet the characters in the shops and houses. There is a Helter Skelter, Swing Boats and traditional fairground side stalls, a 1930's high street has been re-created- 'Between the Wars', there is a recreation of a village with pawnbroker's and cobblers shops, and cafes and fish & chip shops if you need refreshment. You can chat to costumed characters from a bygone era and hear their stories, and discover a fascinating world where costumed characters demonstrate life in the industrial age. You need at least ½ a day to see the attractions, although a full day is really needed if you want to enjoy all there is to see & do. Throughout the year there is a changing programme of events. Open March to October 10-5, winter months closed Mon/Tues & closes at 4pm. 4 ½ hours cruising from Gas Street basin to here. If staying for just 3 nights DAY 2 & DAY 3 will have to be done in one day! Turn around here & cruise the 9 hours back to Alvechurch, maybe stopping off to do some last minute shopping in Birmingham or stopping off at Cadbury World if you missed it on Day 2.